A young Native American man who was adopted by white people discovers his culture through the medium of dance. 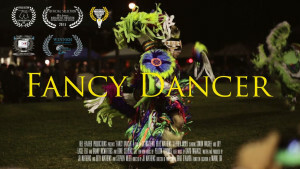 Fancy Dancer is a contemporary love story that follows the life of Kevin Williams, a young Native American raised by white parents, who embarks on a journey fueled by a budding romance with a need and desire to connect to his Indian heritage through traditional dance. Encouraged by his adopted parents to pursue ballet and gymnastics at an early age, Kevin has always lived his life in the White Man’s world, until he “bumps” into Debi Whitecrow. She is a beautiful and striking young Native American woman, who assumes Kevin is a fancy dancer and invites him to a dance. He eagerly accepts and is soon introduced to a world that is foreign to him, the world of pow-wow. A fire is lit.What unfolds is a glimpse of true Native American life with its history and culture so magical and elegant in its form, but misunderstood by the majority. Fancy Dancer is a story of triumph and the strength of passion that can change lives and open hearts. Shown in Dancing Around the World: International Shorts Program.